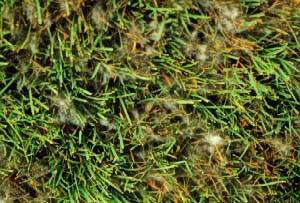 Many species of Pythium cause diseases of roots and crowns that result in a general decline of turfgrass stands. Symptoms are nonspecific with the affected turf appearing thin, off-color, and slowly growing. The disease may occur in small patches or involve large areas, especially on highly maintained golf course greens. Symptoms may appear from early spring to late autumn. In warm, wet weather, large areas of turf may wilt, turn brown, and die. The crowns of individual plants appear water soaked and discolored. Roots are greatly reduced and discolored. Microscopic examination of infected tissue reveals large numbers of oospores (survival structures) and sporangia (spore-bearing structures). Crown and root rot can occur under both low and high soil temperatures depending upon Pythium species. Damping-off: Pythium species are natural inhabitants of the soil. When the pathogen is growing rapidly and seedling growth is slow, disease can result in seedling loss. If moisture, temperature, and light are not optimal for seedlings, seed decay and damping-off becomes more likely. Crown and Root Rot (Root Dysfunction): Many species of Pythium cause diseases of roots and crowns that result in a general decline of turfgrass stands. 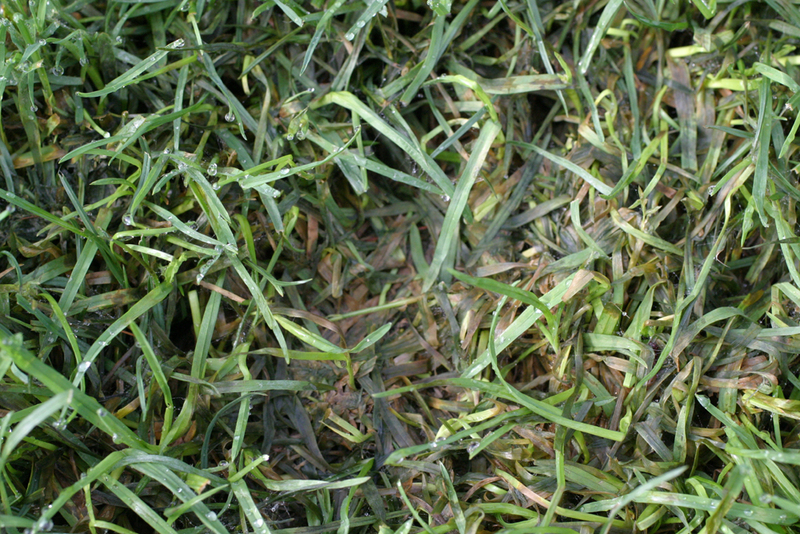 Symptoms are nonspecific with the affected turf appearing thin, off-color, and slowly growing. The disease may occur in small patches or involve large areas, especially on highly maintained golf course greens. Symptoms may appear from early spring to late autumn. 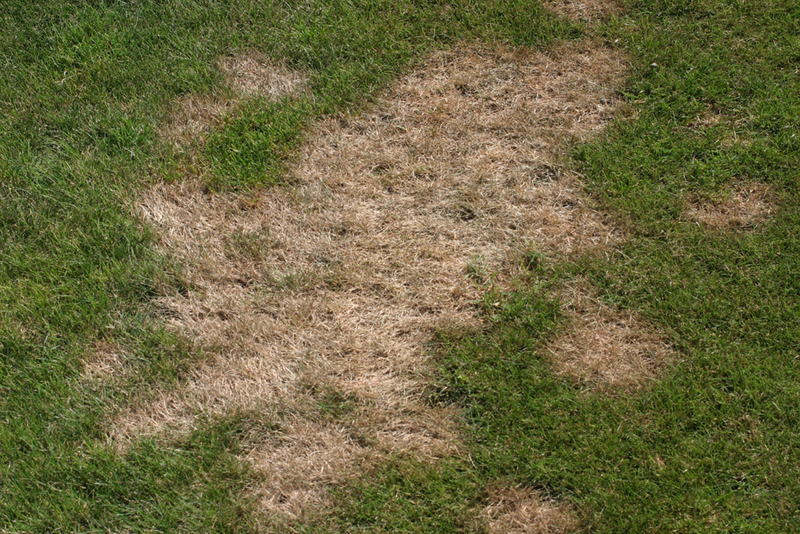 In warm, wet weather, large areas of turf may wilt, turn brown, and die. The crowns of individual plants appear water soaked and discolored. Roots are greatly reduced and discolored. Microscopic examination of infected tissue reveals large numbers of oospores (survival structures) and sporangia (spore-bearing structures). Crown and root rot can occur under both low and high soil temperatures depending upon Pythium species. Snow Blight: This foliar blight is favored by high fertility, poor drainage, extended periods of cold, rainy weather, and saturated soil underlying snow cover. At least six Pythium species can cause snow blight which results in small tan to orange spots or a uniform blight. Foliar mycelium may or may not be present, roots are mostly unaffected, but crowns can be extensively rotted which results in plant death. Snow blight is most serious on turf growing in unfrozen, saturated soil underneath snow cover. Pythium Blight (Grease Spot, Cottony Blight): This foliar blight usually appears suddenly in warm to hot, humid weather. Symptoms are orange to bronze colored, circular spots, 0.75" to 6" in diameter which enlarge rapidly. Blighting may also appear in streaks that follow the movement of water or machinery. Individual leaves appear water-soaked, dark, and oily to the touch ("grease spot"). When humidity is high, especially at night, the collapsed leaves may be covered with a fluffy, white mass of mycelium ("cottony blight"). Spots may coalesce to form large, irregularly shaped areas of dead turf, especially in areas of poor drainage. Foliar blight is most severe when day temperatures are between 86-95 °F and night temperatures are above 70 °F, with high humididty. Improve surface and subsurface drainage. Water thoroughly and infrequently; reduce automatic overhead irrigation and syringe on an as needed basis. Avoid over watering and watering late in the day. Use fungicide treated seed if planting during warm, moist periods. Avoid over-fertilization with nitrogen. Use slow release forms of nitrogen when possible. Mechanically remove thatch if it exceeds 0.5". Do not mow when the grass is wet or when foliar mycelium is present. Affected areas should only be mowed when dry, preferably with a lightweight walk-behind mower. Never mow on rainy days or when soil is excessively wet. Prune trees and shrubs to improve air circulation and light penetration. Promote vigorous root growth by raising mowing height, reducing mowing frequency, and other management practices to reduce plant stress. Avoid aeration, vertical cutting, or topdressing of diseased putting greens. Fungicides targeting Pythium should be applied in recommended tank mixes and rotated among FRAC groups. Resistance to strobilurins (11), mefenoxam (4), and propamocarb (28) has been documented in Pythium populations. Repeated applications of fungicides with the same mode of action favor the development of fungicide resistance. Fungicide efficacy can be increased when applications are based upon weather forecasting models.